Starting the week off RIGHT, baby! Chateauneuf-du-Pape!! We’re back in the saddle this morning here at Last Bottle Planetary Headquarters, tasting mountains of bad wine someone else will try to sell you, while we cherry-pick and import the best juice we can possibly obtain. YES! Bring it! 92 POINTS! OVER 50% OFF (how is this even possible?) and the rockin’, slammin’ great 2015 vintage. Goodness --- it does appear that you CAN have it all. Indeed. Domaine Serguier is one of our finest Chateauneuf discoveries -- located in the center of the village (amazing caves), they make sophisticated, complex and mouth-wateringly delicious wines --- and in a vintage like this they shine even more brightly. What we love so much about Chateauneuf is the fabulous fruit (framboise and cherry) married to the aromatic wonderfulness known as “garrigue”, which is….well, try to imagine lavender, wild rosemary, thyme, juniper, fennel and other sweet herbs blowing in the wind across the Rhone Valley and into your nose. That’s what it’s all about with great Chateauneuf. And HERE it is --- at the best price you will ever see! Just fantastic juice --- BRAVO!! Only a little to go around --- please don’t miss this. The King of GSM blends, from a spectacular vintage, made by a small husband and wife team in Chateauneuf! Does it get any better? In fact it does - just check out the price! Domaine Serguier emerged in the late 19th century under the direction of Hippolyte Serguier. Today Daniel Nury and his wife Aurélie represent the fourth generation of the winery. 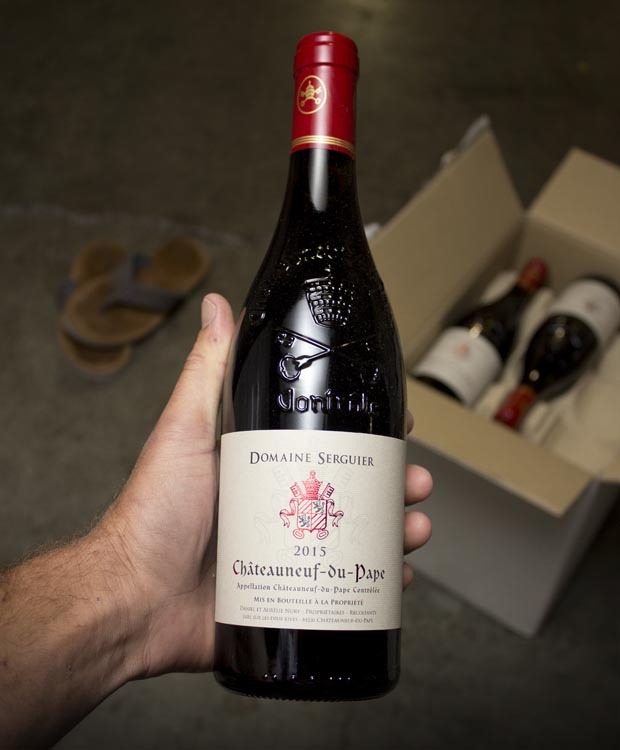 They manage things from their intimate tasting room in the center of Chateauneuf, which is connected to a small, hollowed out cave where the upcoming vintages are racked and vinified under Daniel's meticulous supervision. When Daniel took over in 1993 they were still providing fruit to Pierre Usseglio, and it wasn't until their contract ended that he started using fruit from their 7.2 hectares in Chateauneuf to produce their own wine. Most of the grapes are destemmed and then aged in a combination of mostly used French oak and around 30% new French oak. Domaine Serguier can be enjoyed young, but shows best with 3-4 years of age. Great vintages such as the 2015 can easily push 10+ years aging if you'd like to keep a few in the cellar. Classic meat dishes, veal, pork, beef, lamb, duck, game, roast chicken, roasted, braised, stewed dishes, sausage, barbecue and cassoulet.